MIAMI, Florida, July 4, 2009.- Dominican Republic’s Bethania de la Cruz was honored Saturday night as the most valuable player and best server of the Eighth Women’s Pan American Cup being held at University of Miami’s BankUnited Center since June 26. De la Cruz led Dominican Republic to the silver medal of the tournament and was the event’s second-leading scorer with 108 points, including a tournament-leading 0.83 service ace average and 20 aces. 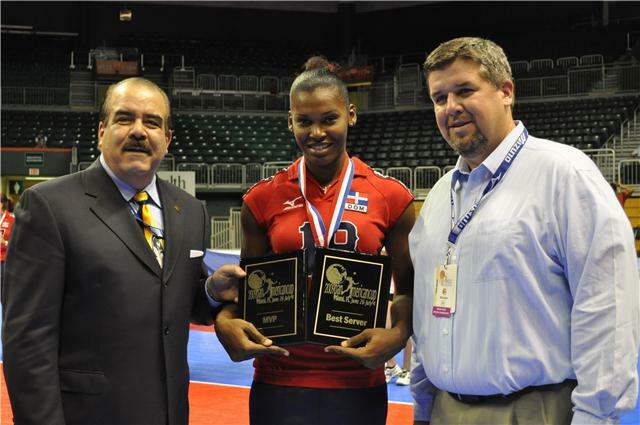 Aurea Cruz of Puerto Rico was honored as the Best Scorer with 151 points via 115 spikes, 16 blocks and 20 aces. The Best Digger was presented to United States’ Nicole Davis as she averaged 3.42 digs per set. Vilmarie Mojica of Puerto Rico earned the Best Setter award with 6.28 running sets average. Danielle Scott-Arruda of USA, who had 22 kills block was awarded as best blocker and Peruvian Yulissa Zamudio was the top spiker with a 52.38 of effectiveness. Peru’s Vanessa Palacios captured two awards – Best Receiver and Best Libero – with a 54.79 efficiency on receptions, and a 60.70 success rate. Brenda Castillo of Dominican Republic was named as the tournament’s Rising Star.